There aren’t many occasions that I get to make wonderful dishes like this as this is most definitely too vegetarian for my dad. As my family fancied fish and chips I got to indulge in some great recipe testing. I love big salad bowls like this. As the British asparagus season is in full swing I am making sure I get to eat lots of it as I only buy asparagus when it is in season so this is why there may be a glut of asparagus recipes uploaded! As I have said before I love creating salad bowls that aren’t just lettuce and tomatoes. 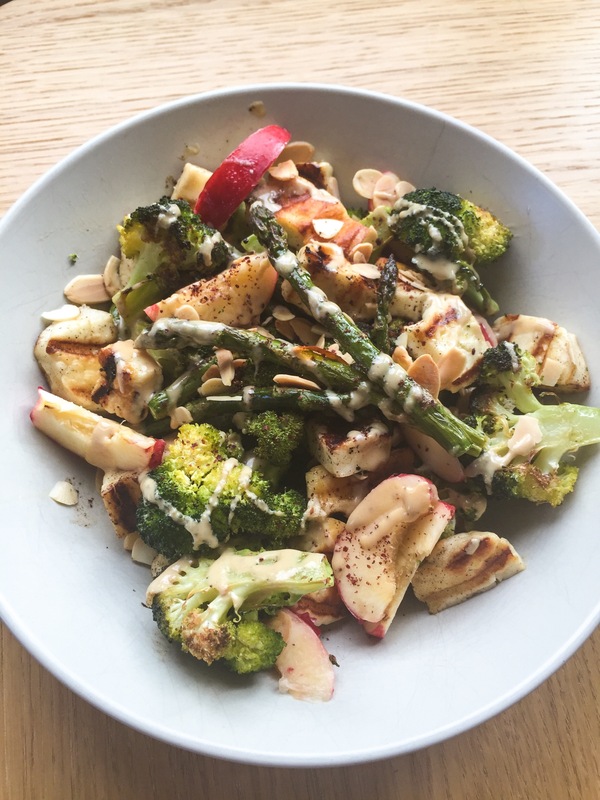 This one is great, the roasted broccoli and asparagus go incredibly well with the sweet white nectarines. This would also be great if you replaced the Halloumi with a soft goats cheese, ricotta or burrata. Yes this would be great with burrata but I can not get hold of it locally unfortunately and now I am day dreaming about burrata… Ok back to the recipe. The toasted almonds add a wonderful nuttiness and texture to the salad. Pre-heat your oven to 180C. Cut the broccoli into small florets, snap the asparagus stems to remove the woody ends. Place the broccoli and asparagus onto a baking tray and drizzle with olive oil then sprinkle with salt and pepper. Place in the oven and roast for 20 minutes. 5 minutes before the end scatter the flaked almonds onto the tray then return to the oven, this will toast them nicely. For the halloumi, cut it into cubes then cook in a hot frying pan with a little olive oil until the halloumi is golden on all sides. Once it is cooked, turn off the heat and pour the lemon juice over the halloumi. 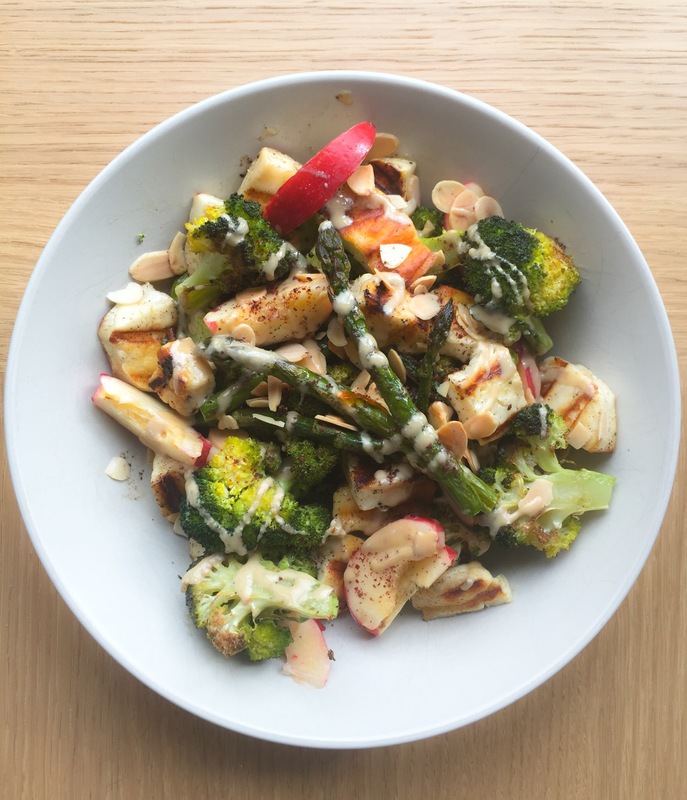 To assemble place the broccoli and asparagus in a bowl, then place on the halloumi and white nectarine. Scatter the almonds over the top, drizzle the tahini over it and then sprinkle with sumac. Oh wow! I bought some halloumi yesterday so I’m going to definitely make this! This sounds like a fantastic flavor combo!